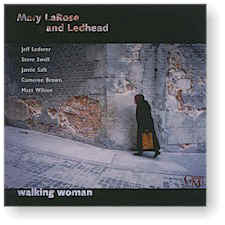 Mary LaRose is an artist who champions the language of vocal jazz in the post-bop era through her unique versions of Lennon-McCartney’s “Blackbird” and Led Zeppelin’s “Kashmir” (for four smooth-as-silk trombones!) and her lyrical renderings of solos by Ornette Coleman, Eric Dolphy, Anthony Braxton, and Charles Mingus. Recorded on January 26, 1998, at Systems Two, Brooklyn, NY.